This pretty Montana Sapphire is set in a dainty sterling silver setting with a slight swirl. Made in Philipsburg, Montana. These 3.5mm Montana Sapphire stud earrings truly are mesmerizing and eye-catching. The color of these sapphires are a beautiful green color. They are created in sterling silver and set in a beautiful rose setting. Made in Philipsburg, Montana. Perfect gift for that special someone. Own a piece of Montana with this gorgeous sapphire housed in and elegant sterling silver rose. This beautiful pendant comes with an 18" sterling silver chain. Matching Montana sapphire rose earrings and a Montana sapphire rose ring are also available. Give this gift as a complete set in either silver or gold. Contact us- we can help you find that perfect piece! Own a piece of Montana with this gorgeous sapphire housed in a simple yet stunning 14k white gold setting. The color of the sapphire is a light teal-blue color. 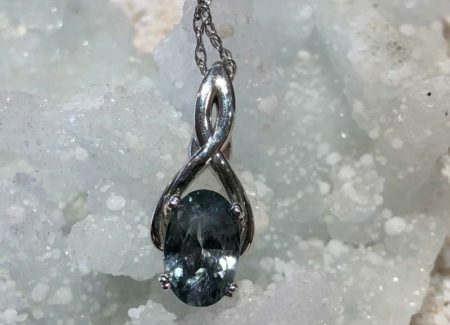 This beautiful pendant comes with an 18" chain. Contact us- we can help you find that perfect piece!